Toshiba International Corporation now offers severe duty, totally enclosed explosion proof motors in low and medium voltage options. Toshiba TEXP motors are available in 1 – 1,000 horsepower and designed to meet UL- and CSA-listed hazardous materials locations requirements. 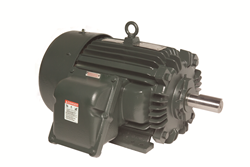 Toshiba International Corporation (TIC) now offers severe duty, totally enclosed explosion proof (TEXP) motors in low and medium voltage options. Toshiba TEXP motors are available in 1 – 1,000 horsepower (HP) and designed to meet UL- and CSA-listed hazardous materials locations requirements. The fan-cooled motors are equipped to contain an explosion that may occur inside the motor, which prevents explosion of gases and vapors released into the environment. The robust cast iron construction meets IP55 and IP56 protection standards and is built for the petrochemical, mining and mineral, pharmaceutical, and agricultural industries. Features of the TEXP motor series include Class F insulation, fabricated diecast aluminum or copper bar rotors, and an operating temperature code of T3-T3C. Motor bearings are heat stabilized and oversized antifriction bearings for longer life, with sleeve bearings as an available option. Nameplates are stainless steel 304 and engraved with a separate UL identification tag. The TEXP low and medium voltage motor series is the latest new product launched by TIC in its 50th anniversary year. Beginning in January 2017, TIC has announced more than a dozen new motor and drive solutions to their ever-growing lineup. Visit http://www.toshiba.com/tic to learn more about the latest Toshiba motor and drive solutions. Toshiba International Corporation (TIC) is a Toshiba America Inc. (TAI) Group Company, a wholly owned subsidiary of Toshiba Corporation, and comprised of four divisions – Motors & Drives, Power Electronics, Automotive Systems, and Transmission & Distribution Systems. Headquartered in Houston, Texas, TIC provides application solutions to a wide range of industries including general industrial, oil and gas, utilities, datacenters, HVAC, water/wastewater, and mining. For more information about TIC, please visit http://www.toshiba.com/tic. The TIC Motors & Drives division, which offers a full range of low and medium voltage motors, adjustable speed drives, motor controls, and power apparatus & components, is anchored by a totally integrated manufacturing process; research and development, design, engineering, production and manufacturing, and aftermarket service and support are all commandeered under one roof. With the capability to test products together as a system before sending out into the field, TIC ensures the highest level of quality, performance, and reliability.